When the final seconds ticked off the clock at the YAIAA girls' basketball championship Friday night, the first person Courtney Dimoff looked for was her father. Dimoff raced into his arms as her eyes started to swell with tears. It was a moment four years in the making. Don Dimoff's Red Lion team had won seven league titles in the last 13 years, but none with his daughter Courtney on the court. The senior forward was determined to put an end to that Friday night at York College's Grumbacher Center. After scoring just one point through a frustrating three quarters, Dimoff, who has been the Lion's go-to player over her four-year career as a starter, came through when the Lions needed her most. First, she tied the game at 30 midway through the fourth quarter, then she gave her team a 33-32 lead with 27 seconds left. After Central York regained the lead at 34-33, the Lions called a timeout and drew up a play for Dimoff to be the decoy while Amy Maciejewski (15 points) would get the ball. But fittingly, the ball ended up in Dimoff's hands. "I looked up at the clock and saw six seconds and I knew I had to do something," Dimoff said. "The ball was in my hands so I just tried to get to the basket and the foul saved me." The league leader in free-throw shooting percentage drove to the basket, drew a foul with 2.5 seconds left and calmly sank both free throws. "I honestly wasn't nervous, which surprised me," Dimoff said of her two late free throws. "I was more nervous in the beginning of the game. I think everything kind of settled in. Since second or third grade, we all wanted this so when it came to the foul shots I knew we had a really good chance of winning, so just put them in like normal." "She's a great foul shooter and she has worked hard at it," Lions head coach Don Dimoff added. "I'm sure myself and the rest of the team were glad she was the one shooting them." To cap off her clutch fourth quarter, Dimoff intercepted Central's desperation inbound heave at the buzzer. "As soon as I saw her heave back, I thought, 'I'm getting this,'" Dimoff said. "Then I just wanted to throw it in the air. It was so great." That's when the celebration kicked off and Dimoff made a sprint for her father. Both Dimoffs credited Central guard Emma Saxton with slowing Courtney down through the first three quarters with her persistent defense. To counter that, Don Dimoff praised junior guard Page Shingler with coming off the bench and hounding Saxton at the other end of the court in the fourth quarter. Shingler made Saxton work more on the offensive end, the coach said, wearing the Central guard down. "That's probably why Courtney hit a couple of buckets down at the other end," Dimoff said. "If it's possible to tire out Emma (Saxton), I think Page did a little." Before the Lions snapped pictures and cut down the nets at York College, the loudest cheer during the medal ceremony came when Dimoff draped a gold medal over his daughter's head. Then the younger Dimoff returned the favor. "It's awesome because the first thing I wanted to do was go run and hug him," Dimoff said of winning a title in her senior year with her dad. "I think I was pushing some teammates out of the way to get to him. It's so awesome to be able to do this with him my senior year." "For counties, yes, for her (Courtney) to hit two foul shots and then stealing it, it's the perfect ending," Don Dimoff said. 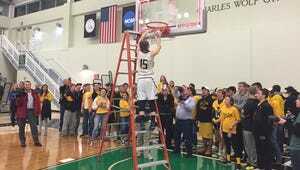 "She has seen so many Red Lion teams come through and win these and win districts. Since she was a freshman, she started all four years, but we haven't been able to win anything. She really wanted to win something. So hopefully this is a building block for districts."